What is the one homemade meal you turn to when you’re not in the mood for cooking? For me, here lately it’s been meatloaf. I’ve never really been a huge meatloaf fan, I mean, I like it but it’s not something I make often. However, this cheesy turkey meatloaf has been in heavy rotation. 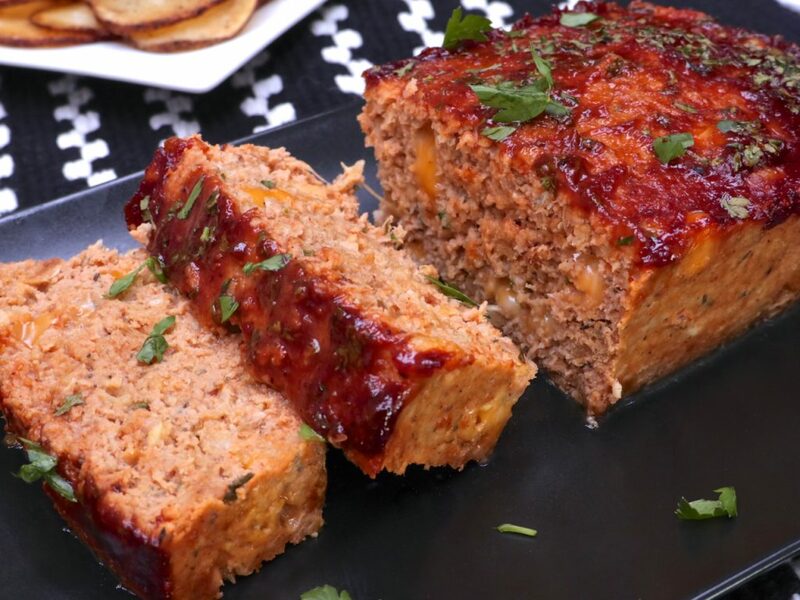 I know what some of you are thinking, “ughhh turkey meatloaf…dry, bland, boring… booooo!” . I can assure you that this turkey meatloaf is none of that! It’s full of savory spices, sweet and smokey BBQ sauce and cheese…baby it’s got flavor! And adding whole milk and olive oil to the mix creates one juicy, moist meatloaf with a tender texture. Like seriously what do you have to lose here!? Try it! 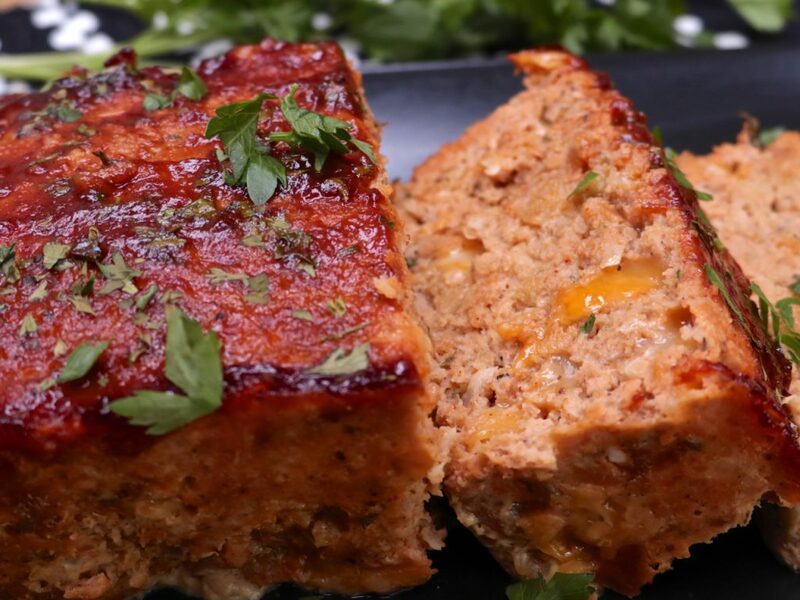 This cheesy turkey meatloaf pairs up well with so many side dishes and creates such a wholesome filling meal! 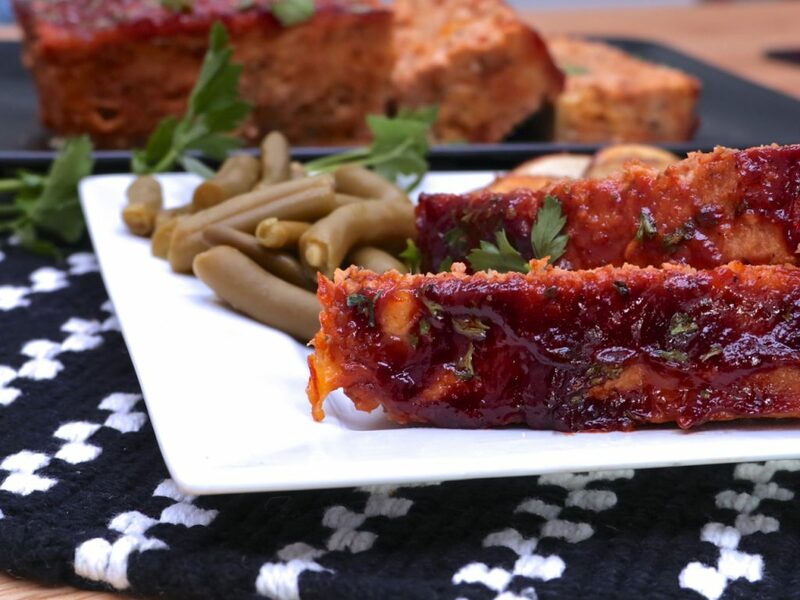 Here are some of my favorite side dish combinations for this turkey meatloaf. Did I mention how quick this comes together? Sure you have to saute the onions and garlic but after that, it’s all one bowl. It’s even great the next day. I usually have to double the recipe so that my husband can make his beloved meatloaf sandwich. If you’re feeling creative try changing up the cheeses a bit. Smoked cheese is so good in this OMG! Lightly grease an 8.5-inch loaf pan. Set aside. In a large bowl add the cooked onion & garlic, ground turkey, crushed croutons, and egg. Mix together ketchup and BBQ sauce and add to the bowl. Add in salt, pepper, smoked paprika, thyme, oregano, sage, and parsley. Add in milk and mix JUST until combined. Do not overwork the meat. *optional*Fry up a tinyl test patty if you want to check the seasonings. Brush the top with BBQ sauce and sprinkle with a bit of parlsey. Cook time: Cooking time varies for me depending on which pan I use. It's quicker when I use my carbon steel pan or the disposable loaf pans. It takes a bit longer in my glass or ceramic pans. Check on it at the 30-minute mark. When I make meat loaf, I like to make sides like mac and cheese, mashed potatoes, cheesy potatoes, and when I make one of them sides I also like to have a vegetable. When I do low carb, I make low carb meatloaf in which I use crushed pork rinds because they don’t have carbs. I also like to use onion, green pepper chopped small like you chop yours. I also add grated parmesan cheese, reduced sugar ketchup, sugar free BBQ sauce (Stubs brand is awesome),and spices. Even when I make meatloaf regular I just use regular bread crumbs. but I think the seasoned croutons sound awesome in this. Hmmmmmm, Hmmmm Good!!!! I was doing the happy dance when I tasted this meatloaf. I just moved and couldn’t find my measuring spoons and did not follow the measurements for the seasonings, so my guestimates worked well. In addition to colby cheese, I added jack pepper cheese and did the grounded croutons instead of breadcrumbs. It was simple recipe to follow, but oh so delicious. That is three for three Diva. I tried your vegetarian collard greens and your potato salad – the outcomes were great as well. I like to have broccoli and cheese for a side dish. I also like cheesey potatoes but since I’m low carb right now, I can’t have them.. booooo lol I will use plain pork rinds for the bread crumbs tho. I just tried this tonite and it did not come out like your video. I followed the instructions ver baitum so I’m not sure what went wrong. After 35 min of baking, the turkey was still not fully cooked and it had juices running all through the bottom of the pan. After putting the loaf back in the oven for an additional 10 min, still no success. I’ve tried several recipes on this site and all have worked out fine. Maybe a beef meat loaf would work bettter for me. Awww I’m so sorry to hear it didn’t work out for you. I’m not sure what went wrong. I don’t have much juice with this recipe. Maybe a leaner turkey would work best. Wow! This Turkey meatloaf looks scrumptious. I will definitely this recipe. Thanks for sharing this delicious recipe. Would this work the same with ground beef? Ground beef has more fat so you’d need to make some adjustments. I have a meatloaf recipe using ground beef on my site that may be helpful.